I was born in 1936, second of four daughters to wonderful devoted Evangelical Christian parents in Appleton, Wisconsin, USA. At the tender age of five I declared that I wanted to be an artist and have never wavered in this pursuit. I graduated from Appleton High School in 1955, earned a Bachelor of Science Degree in Art Education from the University of Wisconsin, Madison in 1959 and a Bachelor of Fine Arts Degree in ceramics from Alfred University, Alfred, NY in 1961. After a brief career designing pottery for Taylor, Smith and Taylor, Chester, West Virginia I came to Minneapolis to teach art at Henry High School and later Olson Junior High for three years, and also taught art in the vocational adult evening school and had several home bound students. While skiing I met George E Bohlig, a chemical engineer for 3 MCompany. We married in 1963. Art studies continued on a James J. Hill scholarship at the Minneapolis Art Institute College of Art. We became the parents of two sons and as a young mother I made pottery in someone else’s studio and took various night classes at The Minneapolis Art Institute College School of Art. There in 1974 in an etching class I needed subject matter. While listening to a sermon entitled 'The Wolf in Sheep’s Clothing' I got an idea which was refined (I love the design part) for the first etching on a biblical theme. After making several other etchings, I again used a biblical theme and it occurred to me that if these were designed as modules they could become a series, a unified thing multiplying the effect, while still serving perfectly well as single units where any number can be shown together to make a unified display. The etchings are designed to honor God and to enable people to surround themselves with thoughtful, well designed original art, conceived and constructed entirely by using time honored means and methods and the finest possible materials. Which all means that great care was needed to present these in a form acceptable to modern eyes. Some methods I used to do this are: work hard to make a design that complements the space or change the space to complement the design, use well all the design elements of line, space, form, value, pattern, perspective or avoidance of perspective, avoid overt sentimentality (a tough call with the tender moment of new birth), use stylized concept rather than visual reality, incorporate a little a bit of gentle humor and add the biblical quote so people know the reference. We lived on the outskirts of Minneapolis in Richfield, Minnesota from 1963 to 1976 when we planned and built a home further out on 2 acresin rural Eagan, Minnesota with an art studio between the house and garage. By then I was well into etching, bought an enormous press and set up the studio for that. From 1980 to 1983 we lived in Brussels, Belgium for my husband’s job with 3M Company. I bought and shipped a smaller press (still full size) and continued drawing and etching, studied etching at Atelier Aghib and began exhibiting the etchings in one person exhibits in Brussels, The Hague and Antwerp. We have matured. There are now six lovely grandchildren. I passionately work in my studio mostly doing oil paintings, which I began in earnest in 1986. I also make collages which I started doing long ago because they are fun and funky. 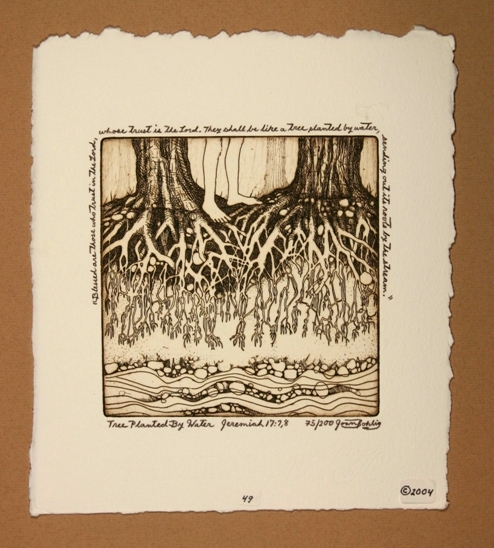 There are now 75 etching images on biblical themes. To date there have been one-person shows of my art at 121 venues showing etchings, collages, and paintings in the USAand in Europe. They are in many church, college, and private art collections in most American states and in twenty additional countries. They are included in collections at ValparaisoUniversityMuseum, DortCollege, Westminster Presbyterian Church and BillyGrahamMuseum, which bought one of each of the etchings when they hosted a one-person show. My work has been in many publications and was used on several book covers. 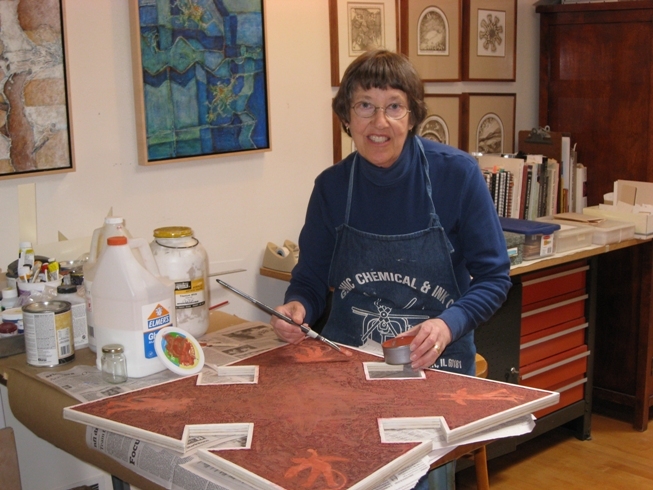 I illustrated two books, the etchings were used for an entire calendar for the Evangelical Lutheran Church of America, and I have also been a juror for several art shows. Since 1966 I have been a member of Manamore, a local women’s art group, and was 2009-2010, 2013-2014 Program Chairwoman and on the board of directors. Since 1979 I have been a member of CIVA, Christians in Visual Arts, a national Christian arts organization and have been on their board of directors. A whole show of my collages which I called ‘New Directions’ was first put together in December 2007. Since then I have had shows exclusively of collages at eleven additional venues. Each show varies considerably. Working with biblical themes has been a great blessing to me personally in many unexpected ways. There is satisfaction in knowing that I have spent my life work trying to bring positive energy and goodness and beauty into existence and into the lives of others. To God be the glory. 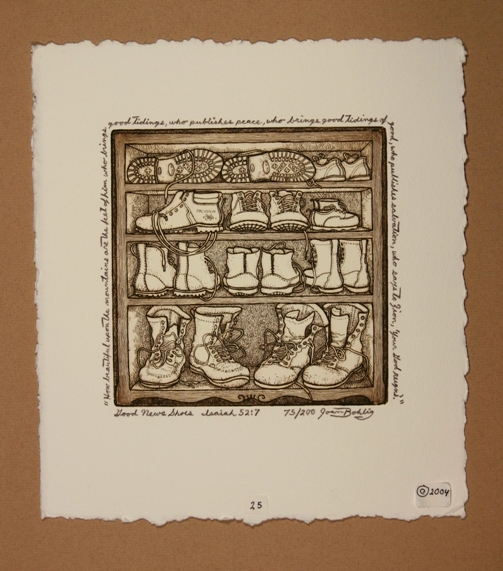 Good News Shoes, original copperplate etching: 6" x 6" image on 8 3/4 x 9 3/4 French BFK or Rives quality etching paper, ink either burnt umber or black, unframed. 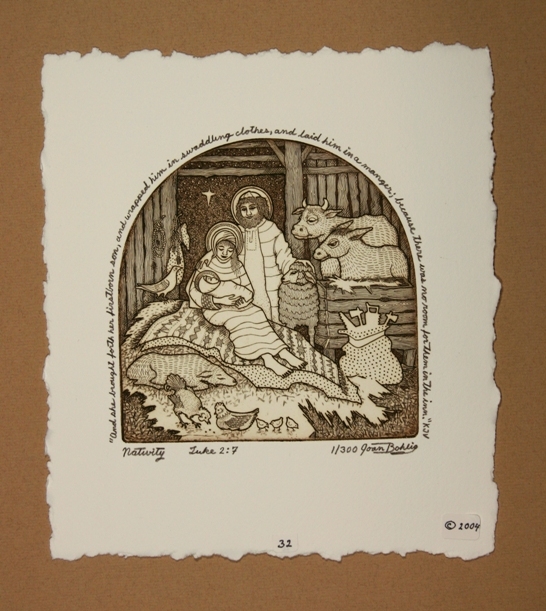 Nativity, original copperplate etching: 6" x 6" image on 8 3/4 x 9 3/4 French BFK or Rives quality etching paper, ink either burnt umber or black, unframed. Vine with Birds, original copperplate etching: 6" x 6" image on 8 3/4 x 9 3/4 French BFK or Rives quality etching paper, ink either burnt umber or black, unframed. 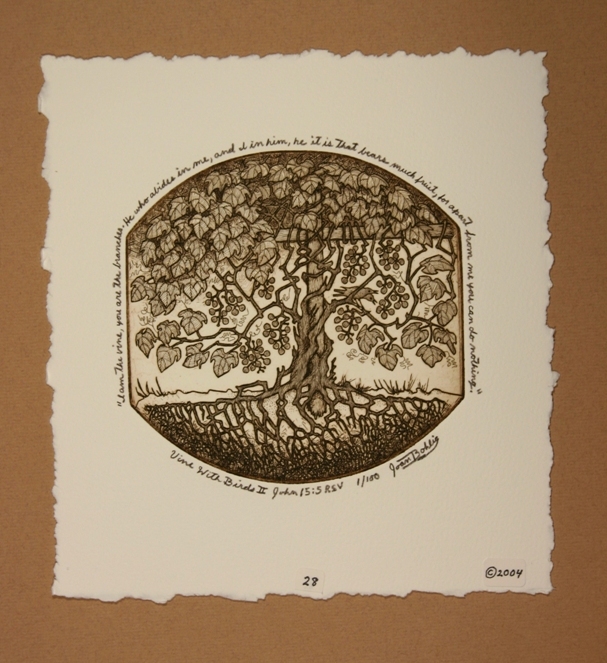 Tree Planted by Water, original copperplate etching: 6" x 6" image on 8 3/4 x 9 3/4 French BFK or Rives quality etching paper, ink either burnt umber or black, unframed. Offense /Defense, collage, 36" x 36" birch plywood substructure, composition board, textured paper, drawings, red bole ink and varnishes. The idea was of good and evil as opposing forces with the cross a refuge and aid, sending out its power in the compass directions. Good and evil radiate in those same compass directions in opposition. I do not believe in demons in red underwear, but I certainly do believe in good and evil and the power of Christ in aid of the side of goodness. I did a good number of these compass crosses with variations. 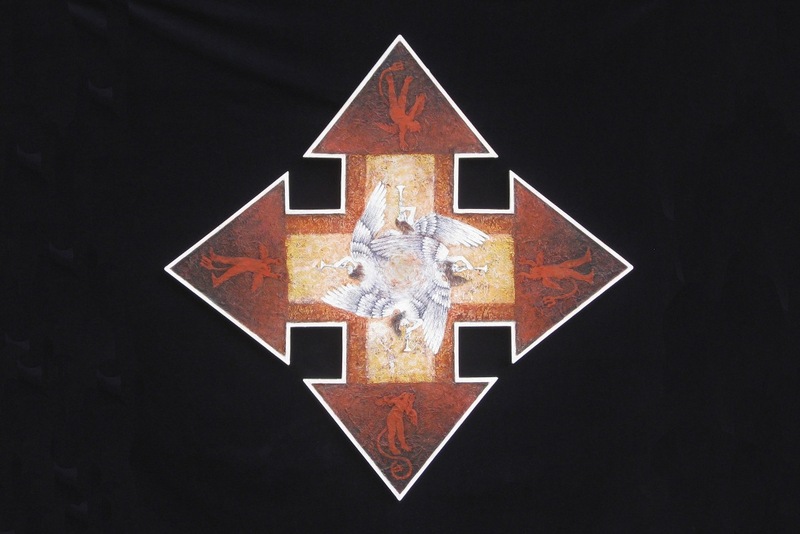 The compass cross could be suitable as a chapel cross in an intimate space.